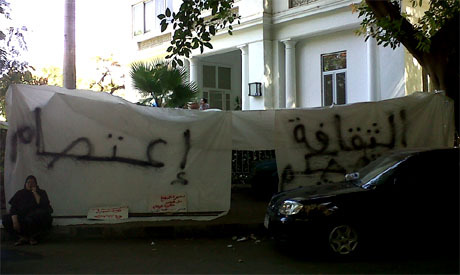 Artists’ occupation of the Ministry of Culture building located in Cairo’s Zamalek district enters its second day. The atmosphere of the dimmed halls of the ministry today morning, Thursday, 6 June, didn’t resemble anything the institution has witnessed over the past decades. Following the unprecedented move by artists who yesterday entered the ministry and took over its offices in protest against the policies of the newly appointed minister of culture, Alaa Abdel-Aziz, nothing seems to indicate that the artists will leave the building soon. Around 30 artists spent the night inside the ministry: scenarist Said Fouad, painter Mohamed Abla, publisher Mohamed Hashem, among many others. They plan to continue their occupation of the building until the minister steps down or is dismissed. “We taking shifts to make sure there is always a group inside the building,” Ahmed Helba, scenarist and one of the protesters who spent the night in the ministry, told Ahram Online. “We will wait until the minister is removed,” Mohamed Galal, cinema and theatre actor added. “We have time, even though I don’t expect Alaa Abdel-Aziz to step down easily. He will be removed with all of them, at the same time,” he continued referring to the government and President Mohamed Morsi. Yesterday, many artists who gathered around the ministry’s meeting table expressed that even if Abdel-Aziz’s removal takes weeks they are determined to see it happen. “We refuse the minister who is affiliated with the Muslim Brotherhood. We demand his dismissal, not to mention that we also demand the removal of the one (referring to President Morsi) who placed him on top of Egypt’s culture,” Essam Said, theatre director, told Ahram Online yesterday. According to Mahmoud Awad, a director who spent night at the ministry, last night the artists contacted 14 out of 17 units operating in over 850 locations under the culture ministry. “All of those contacted expressed their solidarity with the ministry occupation and protest. Among them are Supreme Council of Culture, the Cultural Development Fund, the Supreme Council of Antiquities, the Egyptian National Film Centre, the National Centre of Translation, the National Centre of Fine Arts, the Academy of Arts, the National Book Organisation, among many others,” Awad explained. Many musicians from the Cairo Opera House support the protests, though according to its new head, Badr El-Zakaziky, The Opera House’s companies are not suspending their activities, a stance that was decided by vote among artists within each company. As the occupation of the culture ministry continues, according to Galal, artists will hold a closed meeting around noon, followed by a statement announced after that. In the afternoon they plan to launch a series of artistic events. “We are preparing a complete programme of music performances to begin today in the afternoon. The line-up will include performances of Azza Balbaa, Eman El-Bahr Darwish, Ramy Essam, Eskenderella, among many others,” Galal told Ahram Online. Mahmoud Awad added that filmmakers plan to set up a screen where they will show films about Egypt’s January 2011 revolution. In pallalel, drawing and painting activities will be launched for the youngest passers-by. The unprecedented occupation by artists of the ministry is in response to the culture minister firing many high-profile artists from leading cultural posts, and in opposition to the minister in general. Yesterday, Wednesday, 5 May, artists entered the ministry building while dozens demonstrated in front of the ministry, a group grew into the hundreds by the evening hours.